Turkish Delight- Hello everybody, welcome back with ZetiraKitchen! Today i will share How to Make Turkish Delight. Turish Delight get viral once aired in the movie Narnia. The scene when whitch white give this candy to a boy. 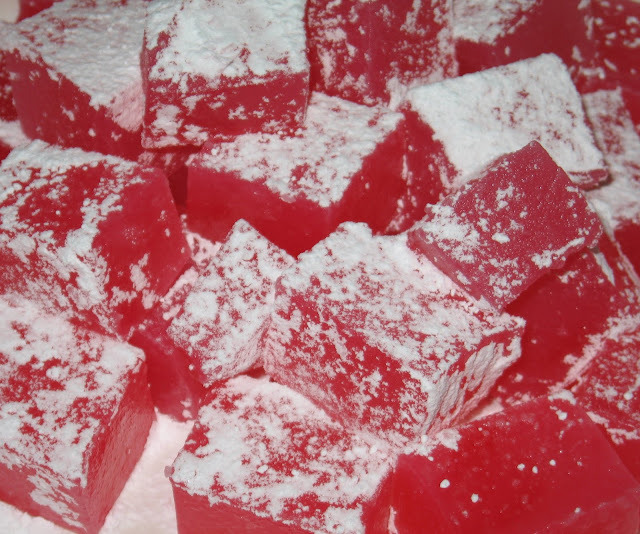 Turkish delight is like jelly or family of candy. That make its different from another candy, it made mixture with rosewater. They often eaten in small cubes dusted with icing sugar, cornstarch or powdered cream of tartar, to prevent clinging. Variety flavors you can met include strawberry, cinnamon and mint. So let's try to make! Prepare pan and wrap it with aluminum foil. Spray the foil with nonstick cooking spray. Pour the sugar, lemon juice, and 1 1/2 cups of the water in other pan with medium heat. Stir it until the sugar melting and continue stir the mixture to a boil. Brush down the sides of the pan with a wet pastry brush to prevent sugar crystals from forming. Then without stirring allow until boiling (240 F) . When the sugar syrup is around 225 F, begin to get the rest of the candy ingredients Place 3 cups of water in another pan. Add the cornstarch, cream of tartar and whisk until mixture smooth. Place the pan over medium heat and bring the mixture to a boil. Then stirring constantly until will become thick and pasty. If it on 240 F, remove it from heat and pour it into the cornstarch.Then whisk it. Low the heat and whisking it until the candy has turned a light golden-yellow color and is very thick and gluey (1 hour). After an hour, remove and continue stirring with add food coloring, the rosewater. Pour the candy into the prepared pan covered foil and allow it to set overnight. The next day, remove the candy from the pan foil. Powdered your table with powdered sugar, and flip your candy into the powdered sugar. Remove the foil from the back and dust the top with the sugar. Chop candy into small squares. Your Turkish Delight ready to serve.